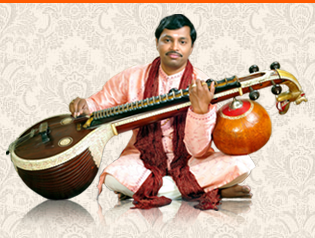 The first & the only Veena Artiste from Andhra Pradesh to represent India at UNITED NATIONS in showcasing Indian Cultural Heritage & the recipient of prestigious Ugadi Visishta Puraskaram from Govt.of Andhra Pradesh for the year 2011-12 and also the recipient of The BEST VAINIKA award from the Prestigious Madras Music Academy 2011. "Under the auspices of Sri Raja Rajeswari Gana Sabha, Mehdipatnam, Hyderabad, D. Srinivas an upcoming Veena Artiste presenting a pleasing recital at the sabha. Srinivas has an effortless technique of playing and producing fine tonal quality. His finger movements are smooth even in in high speed play. His approach was traditional."